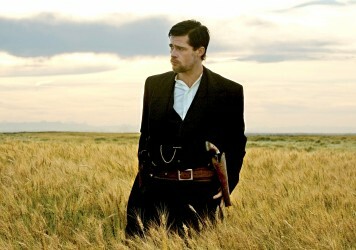 One of the great actors of our generation stars in his first western. Yes please. A really solid, really fun classical shoot ’em up. Definitely something deeper to the surface pleasures, but maybe too subtle for impact. 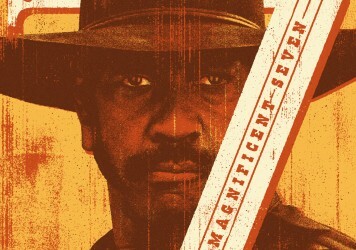 A review of Antoine Fuqua’s The Magnificent Seven in seven chapters. They got the twinge right. The thing that tends to happens directly before a gunfight. It’s somewhere between a tic and a grimace, like the actor is trying to get rid of a fly that’s landed on their jowl, but without using their hands. It’s that muscle spasm thing which heralds death. The camera moves in on the face, the squinting eyes, the pursed lips, then it jolts in to a detail on the cheek just to capture that tiny flickering movement, suggestive of the idea that the subject’s entire body is energised, electrified even, by the prospect of killing another person. This also sometimes happens in movies where a baseball batsman is readying himself for a hit. The Magnificent Seven gets this vital detail correct. Antoine Fuqua has made the best Magnificent Seven movie. Faint praise, for sure, but there’s a dynamism and a clip here that are missing in the lumbering 1960 original. That film made a spectacle of personality which felt more important than the story itself. It was a talent showcase more than a movie. Yul Brynner and Steve McQueen metaphorically chest-bumping for supremacy is a relic from a bygone age, making their supposedly selfless heroes look like tough guy prima donnas. This version comes with equality, and no ego whatsoever. We merely have seven actors, each playing to their personal strengths. Any remake of a classic (or at least beloved) movie begs the question, why now? And oftentimes, why ever? Instead of roping in a line-up of cheroot-chomping A-listers as in the original, Fuqua’s refit opts for a more racially diverse collective. The film can be read as a coalition of the willing banding together to fight a white oppressor, Bogue, here played as a bored and prickly brute by Peter Sarsgaard. Maybe the casting has been made for cynical reasons, so the film might have stronger box office legs in territories beyond the US. Or it might be a statement on combatting the wave of xenophobia that has swept over the western world. Fuqua himself has said that this was not intended as a political film, and it comes across that way. He doesn’t push the material for “relevance”. Because of that, the film’s allegorical potential is that much richer. The film is most potent as an expression of the part played by religion in American life. During its prologue, Bogue and his men interrupt a church meeting in which the denizens of southern mining town of Rose Creek discuss options to avert a hostile takeover. It’s all for naught, as Bogue employs crooked maths to draw the line between aggressive, anti-humanist capitalist takeover and our Lord and protector. He duly usurps the meeting and torches the building. As a final insult, the bell drops from the tower, signalling the death of hope. Prior to the climactic battle, in which the seven prove that grass roots collective power can overcome mass aggression, a point is made of reinstating the bell as a symbol of God’s return to the town as an unseen protector. For better and worse, there are hints of parody and generic appropriation in this retooled Magnificent Seven. Fuqua makes Rose Creek come across as a comically standardised wild western burg, even down to the undertaker being the first ominous sight you see upon moseying into town. There’s the central byway, the bar, the jail, the office, the mercantile. It all feels too familiar, like no thought has gone into updating the geography of the location. A Comanche brave named Red Harvest (Martin Sensmeier) takes a spot on the rooftops, firing arrows downwards as evil mercenaries sluice into their trap. Washington’s Sam Chisum is point man, his daredevil stunt work and fancy shooting style both feeling mightily rote. Familiarity breeds contempt, and seeing the same two-horse town as the stage for high drama certainly diminishes the thrill. Haley Bennet plays the film’s sole female character, an avenging strawberry blonde angel named Emma Cullen. She wants to be part of the seven, but her gender disallows it. Where the seven may be able to look beyond racial and cultural divisions at the service of the greater good, women don’t fit that equation. There’s a shot where she is seen mourning her murdered husband, leaning over his fresh corpse. Cullen is wearing a very low-cut muslin top, her ample cleavage (rather than her anguished expression) is centre frame. It’s a similar case in most of the scenes she’s in. Chris Pratt’s wisecracking card sharp, Josh Faraday, even makes a point that, if she’s really interested in killing, then she’ll need to start wearing trousers. She’s handy with a rifle, but that’s the extent of her participation. We never see her save anyone, and the moment she gets into a spot of bother, someone else swings in to rescue her. Perhaps Fuqua and writers Richard Wenk and Nic Pizzolatto want to remain honest about woman being treated as second class citizens in the frontier days. Yet her sexualised damsel status is unfortunate, one of the more irksome throwbacks to 1960s attitudes. As an example of classical Hollywood construction, The Magnificent Seven does the job. The casting is spot on, and with very little effort, Fuqua manages to create a set of rich characters with meaningful back stories. The original was first and foremost a blockbuster, and this new version strives for the same goal. It also works as an interesting example of how the now culturally ubiquitous superhero genre may have had its roots in the western. It likely won’t go down as one of Washington’s vintage performances, but he does what he needs to do for the job at hand. His bushy moustache and sideburn combo, plus head-to-toe black trimmings, even lend the film the faint perfume of the blaxploitation genre. No wagon wheels are being reinvented here, and there ain’t nothing wrong with that. 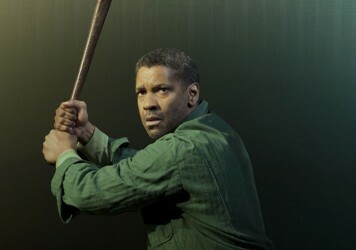 The iconic leading man is set to bring an acclaimed stageplay to the screen.